As many of you already know, the best way to store basil is freezing it in ice cubes. You can also freeze together different varieties of basil: thai basil has a wild aroma, tulsi is more delicate, cinnamon and licorice basil add the aroma from which they are named. 1. Harvest basil leaves and tops. Wash them and put on a kitchen towel to dry them. 2. Mince with mezzaluna or a blender. 3. 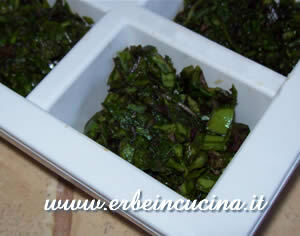 Put the minced basil in an ice cube container and store them in the refrigerator. I use this method to store all my basil plants. 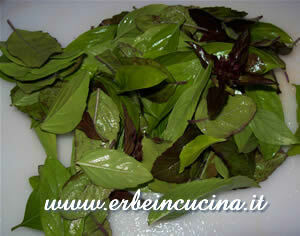 Basil can be also dried, but it will lose its flavor soon. 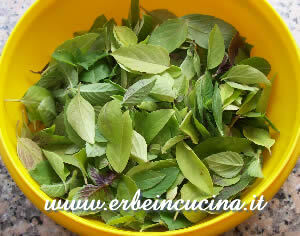 I use dried basil only for the Herbes de Provence (Provençal herbs) mixture. More info: Storing herbes de Provence.